British opposition to search-and-rescue operations in the Mediterranean and Polish pseudo-theological justifications not to help refugees exploit the insecurities of the humanitarian movement. 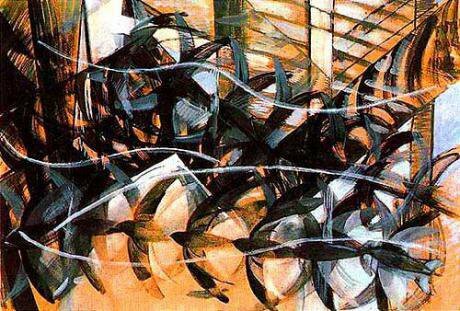 'Flight of the Swallows' by Giacomo Ball (1913). Photo: Wikipedia. Some rights reserved.As the Mediterranean death toll shows no signs of abating, humanitarians involved in addressing the crisis are having a difficult time. Recent academic critiques have pointed out the flaws of contemporary international humanitarianism, noting humanitarians’ white saviour complex, their complicity with the forces of militarism and capitalism, the ways in which they deprive the people they are ostensibly helping of agency, and the ways they trap them in a condition of perpetual depoliticised victimhood. Equally recently humanitarian activities of various kinds have been the target of political undermining and outright assault coming from the political right. One striking example is the official British position to oppose search and rescue operations in the Mediterranean because, as the subsequent Tory governments have claimed, such activities act as a “pull factor” that simply tempts more migrants into risking their lives. This claim has circulated also elsewhere in Europe. Meanwhile in the United States the concern of the new administration has been not so much with repelling refugees as with outright banning their arrival. Humanitarianism may be defined at its most basic as “concern for human welfare as a primary or pre-eminent moral good; action, or the disposition to act, on the basis of this concern rather than for pragmatic or strategic reasons” (OED online). This broadest definition applies to anyone acting on the grounds of a moral commitment to the alleviation of suffering. This includes members of the humanitarian establishment in well-funded international organizations as well as activists in start-up NGOs who would likely bristle at being called ‘humanitarians’ precisely because they are so keenly aware of the dubious track record of some of the biggest humanitarian players. This brings me to the other concept in the title. Hannah Arendt borrowed the phrase “dark times”, from Brecht’s 1939 poem “To Posterity” (linked here in a different translation). She wrote of the 1930s that “the disorder and the hunger, the massacres and the slaughterers and the outrage over injustice … All this was real enough as it took place in public … and still, it was by no means visible to all … for until the very moment when catastrophe overtook everything and everybody, it was covered up not by realities but by the highly efficient talk and double-talk of nearly all official representatives who, without interruption and in many ingenuous variations explained away unpleasant facts and justified concerns” (emphasis added). Our contemporary version of Arendt’s “efficient talk” is the discourse of border control that relies on the rationalities of security, economic interest and military technology to hide from view violence perpetrated against hundreds of thousands of people. And so we hear persistently of the need for a “crackdown on human smuggling” as politicians scapegoat the smugglers to conceal their own responsibility for the unending deaths at sea. The pinnacle of Arendtian double-talk here has to be decision to name the EU naval mission to tackle human smuggling out of Libya “Operation Sophia” after a baby born to a Somali mother on a German ship that rescued her mother off the coast of Libya in August 2015. The UK is of course parting ways with the EU and its government no longer even pretends to care for migrant children. The former Home Secretary and now Prime Minister Theresa May has disavowed search and rescue, whether it be state-sponsored as in the case of Mare Nostrum, or carried out by NGOs or other independent actors. Statements by border control “experts” asserting that trafficking gangs conspire with the Coast Guard to smuggle migrants into the EU under the pretext of humanitarian rescue operations enjoy broad credibility in the UK, printed in broadsheets and tabloids and circulated on the Internet. One such expert took aim at UNHCR in his comments for the Telegraph, when he opined that “The UN’s idea that one is obliged morally to take in people coming across in boats is a dangerous one … Some of these people are desperate, but a good proportion are economic migrants, and either way, you shouldn’t be encouraging people to risk their lives in a boat.” The insidious effects of the phrase “economic migrants” are well known, so there is no need to rehash them here. Instead it merits noting how the “moral obligation to take in people coming across on boats” becomes a fanciful “idea of the UN” rather than a description of a fairly uncontroversial moral principle that constitutes a response to the inherent dangers of maritime escapes. People may of course legitimately disagree on the extent of hospitality owed to those who arrive, but those questions cannot be meaningfully resolved through democratic deliberation if the passengers of the boats are consistently and deliberately dehumanized. A different example of how humanitarian responses to the Mediterranean crossings can be effectively discredited comes from Poland. In 2015, at the time when the number of people arriving in Europe reached its highest level, Poland’s centre-right government reluctantly agreed to take part in the European Union’s solidarity mechanism for resettling refugees arriving in Italy and Greece. Based on that mechanism Poland would have accepted up to 12,000 refugees by 2017, but the new right wing government, which came into power following the October 2015 election, rescinded the deal. Jarosław Kaczynski, Poland’s de facto leader who holds no elected office but rules from behind scenes as the head of the Law and Justice party made headlines in late 2015 when he claimed that migrants must be stopped at the border because they carry parasites and disease into Europe. Less well known is the fact that he grounds his refusal to accept to refugees in the principle of ordo caritatis, which he translates as the “order of mercy,” and which he claims derives from Aquinas. According to this principle, as rendered by Kaczynski, the faithful are obliged to first show mercy to those closest to them, that is the family, then to their compatriots and only in the last instance to foreign strangers. I will set aside here the quarrels that theologians might raise with Kaczynski’s interpretations of Aquinas. The important point is that the phrase ordo caritatis entered popular discourse in this predominantly Catholic country. It now serves as a rebuttal as much to the so-called “leftist radicals” who support welcoming refugees as to those Catholics who interpret the Christian duty to help the needy more in the spirit of Pope Francis than Kaczynski. I propose that the hard-headed British embrace of anti-humanitarian rationales and the Polish pseudo-theological justifications of the refusal to help not only represent extreme cynicism but also exploit the insecurities of the humanitarian movement which has been scarred by its past failures and overreach. Disappointed humanitarians may retreat or further compromise their principles by letting themselves be co-opted for the agendas of border securitarians. Nonetheless an opportunity lurks within the post-humanitarian landscape to re-embrace the most basic commitment to human welfare and the alleviation of suffering and to insist on its status as the moral horizon in our dark times.